The ancient Five Tibetan Rites don’t get nearly us much press as they should, considering they might just be the fountain of youth. We throw tons of money out the window all of the time in the search for products that might help slow down and reverse the aging process, but the five rites are a simple set of exercises with endless stress-reducing and youth- and vitality-preserving benefits — and they can be done at home without wasting a penny. Each of the Five Tibetan Rites are made up of a set of movements that are repeated 21 times. When practiced daily, they are said to enhance mental clarity and memory, balance hormones, improve health and support emotional well-being. How do the Tibetan five rites work? Our glandular system governs youth and vitality. The Five Tibetan Rites are said to normalize hormonal imbalances in the body by stimulating energy flow in our glandular system. Practice basic diaphragmatic breathing before beginning the exercises. It is important to connect the breath with the flow of the exercises. Start with three reps of each movement and progressively increase to 21 reps. The number 21 is considered a sacred number to Tibetans. The rites stimulate the chakras (the seven energy centers of the body) and increase a flow of energy from the core outward. Now let’s get into the practice. From a standing position, step feet out about 2-1/2 to 3 feet, with feet parallel and arms extended out in a T shape. Begin to spin in a clockwise direction as fast as you can without losing control. Repeat for 21 revolutions. If you get dizzy, slow down or stop. End the set by inhaling, reaching hands overhead and meeting palms into a prayer position. Then exhale, draw the hands in front of the heart in prayer, taking a few deep breaths to still yourself. This movement is known to release negative energy and balance the emotions. Start in a reclining position on your back, with arms extended by your side and palms pressing onto the Earth (or floor) on either side of hips. On the inhales, draw your chin to your chest and, without bending the knees, lift legs to a vertical position. On the exhales, slowly release your head and straighten legs as you lower them to the ground. Repeat 21 times. At the end of the set, relax the body and take several deep breaths, resting on your back. The second rite strengthens the abs and stimulates the energy center associated with the pancreas. Come to a kneeling position, with hips aligned over the knees and the front of shins and tops of your feet resting on the Earth. Inhale, press your hands on the back of thighs just under buttocks, lift the top of the rib cage, and arch back with the shoulders and head. Exhale, release hands to the sides of thighs and draw your chin to your chest. Be sure to inhale deeply while arching backward, and exhale deeply while tucking chin to chest. Repeat 21 times. This exercise opens the solar plexus, heart and throat. It also helps cleanse and balance the emotions. Begin in a seated position, with legs extended straight out in front of you. Keep your spine erect while pressing palms onto the ground on either side of the hips, with fingers pointed toward feet. Inhale, press through your feet and hands, bend your knees and come up to a tabletop position, with your head tilting gently back. Exhale and slowly release back to a seated position; gently release your chin to the chest. Tense all the muscles in your body as you press up; relax the body when you lower down. Repeat for 21 reps. This pose increases energy to the sacral region and is a gentle way to strengthen the thighs and glutes. From a tabletop position, walk knees and feet back 5 to 6 inches, then tuck toes under so you are on the balls of the feet. On an exhale, lift your sit bones upward and bring the body into a V-like shape, into the Downward-Facing Dog pose. On an inhale, slowly bend through the elbows, bringing the rib cage forward and down, then press firmly through the hands and lift your chest up and forward, coming into a variation of Upward-Facing Dog pose. 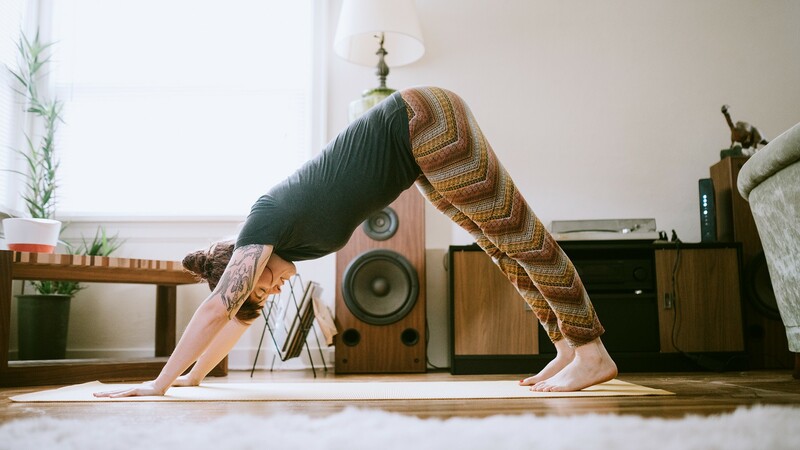 On the exhale, lift hips up and back once again, coming into Downward-Facing Dog pose. Inhale to Up Dog; exhale to Down Dog. Repeat 21 times, resting in child’s pose for a few breaths once completed. This is the most vigorous of all the rites and is a great way to revitalize the energy centers in the body. Once finished, come to a neutral position lying on your back in corpse pose, allowing the body to become completely still and calm. Relax in corpse pose for three to five minutes before completing your practice. Never push yourself to exhaustion. Don’t forget to start with three reps and work up to 21 reps; this allows the physical and energetic body to acclimate to being harmonized and balanced. Alexandra Bruin Earl has taught yoga since 2009 and has studied with some of the world’s most renowned yoga teachers. She specializes in deep relaxation and spine and joint health and offers personal and group yoga lessons. Read more about her and services on her website. A version of this article was originally published in November 2013.